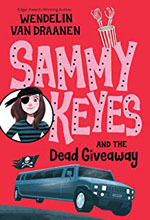 The tenth mystery in the popular Sammy Keyes series offers more spirit and adventure than ever! The tenth mystery in the popular Sammy Keyes series offers more spirit and adventure than ever! Sammy accidentally makes a deadly mistake, but all clues point to her nemesis Heather, and she gets blamed. As Sammy struggles with her conscience she gets distracted helping an ailing senior citizen in her fight against urban renewal.